"While some might mistakenly consider value investing a mechanical tool for identifying bargains, it is actually a comprehensive investment philosophy that emphasizes the need to perform in-depth fundamental analysis, pursue long-term investment results, limit risk, and resist crowd psychology." Major equity markets rallied this past month, and the MSCI World Index rallied +2.2% with some markets setting new all-time highs while the frontier markets overall also fared well. All of our funds showed healthy returns while indexes advanced. The MSCI Frontier Markets Net Total Return USD Index gained +1.2% this month and is now up +27.9% YTD, while the MSCI Frontier Markets Asia Net Total Return USD added an astonishing +13.9% this month and is now up +37.2% for the year. However, the rally in the latter index was primarily due to a few highly weighted Vietnamese stocks which we discuss in more detail further below. After several difficult months for the Pakistan market, it performed better this month and the local index showed a modest positive return. 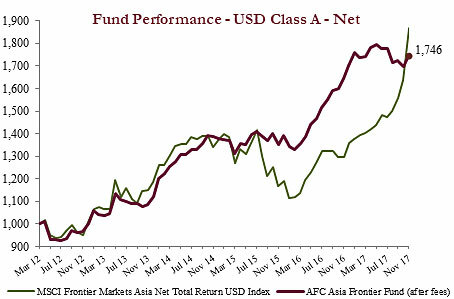 The AFC Asia Frontier Fund added +2.5% and is now up +74.6% since inception, which corresponds to a healthy annualized return of +10.3% p.a. since inception, reflecting the strategy’s ability to generate consistent long-term returns. 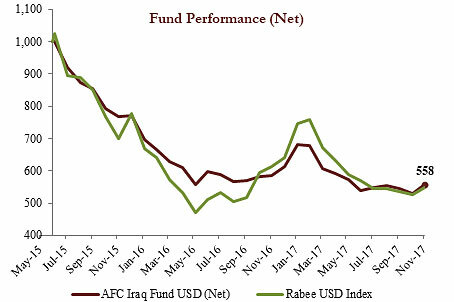 The AFC Iraq Fund returned +5.2% in November, outperforming its benchmark, the Rabee USD index, which gained +4.2% and its performance year to date is −9.1% compared with the benchmark which is down −14.4% for the year. The AFC Vietnam Fund gained +1.5% in November, underperforming the VN-Index in USD terms which gained +13.5%. The fund is now up +13.3% year to date and +85.4% since inception, which corresponds to an attractive annualized return of +17.0% p.a. The AFC Asia Frontier Fund (LUX) was launched on 1st December 2017 in order to provide better and easier access for our European investors. The fund, which is a “Parallel Fund” to the “AFC Asia Frontier Fund”, is a SIF fund and is available to European professional and ‘Well-Informed Investors’, and is also available to non-European investors. The Luxembourg-based fund is investing up to 84% in the existing Cayman Islands-based AFC Asia Frontier Fund (Non-US) and the balance is allocated in stocks that the Cayman Islands fund also holds. We expect that the performance of the Luxembourg-based fund will be very similar to the existing Cayman Islands-based fund. The factsheet of the AFC Asia Frontier Fund (LUX) is available and a link to it will be provided in each newsletter going forward (below the manager comment of the AFC Asia Frontier Fund). We would like to welcome Ari-Pekka Hildén, a Finnish citizen and long time experienced fund manager with deep knowledge in emerging and frontier markets to the board of the AFC Umbrella Fund and the AFC Umbrella Fund (non-US) in order to strengthen the board of directors with a second independent director. Ari-Pekka previously sat on the board of other emerging and frontier market funds or investment committees and Ari-Pekka, due to his knowledge and experience, certainly helps to strengthen the oversight and corporate governance of the board of the AFC funds. For Ari-Pekka Hildén’s biography please click here. AFC Iraq Fund’s CIO Ahmed Tabaqchali spoke at the Iraq Banking and Investment Summit which was held at the Royal Tulip Al Resheed Hotel in Baghdad on the 2nd and 3rd of December. 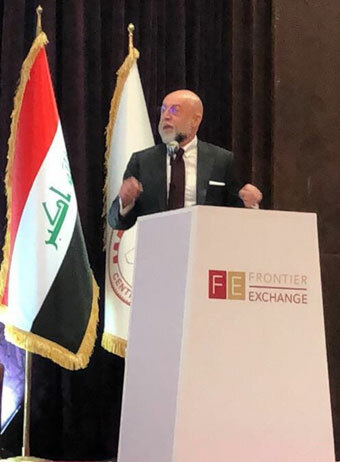 At the event, which was held for the first time in Baghdad, Ahmed confirmed AFC’s investment thesis for Iraq as a post conflict opportunity in arbitraging the gap between perceived and actual risk. A highlight of the conference was a panel discussion with some of Iraq’s young entrepreneurs who have created thriving e-commerce businesses. These factors together offer tremendous opportunities for our funds as these economies mature, leading to a bigger pool of middle-class citizens in the coming decade. For a broadly diversified investment portfolio, an allocation to a well-managed equity fund in promising frontier markets such as our funds should result in an enhanced long-term risk adjusted return. AFC Asia Frontier Fund (AAFF) USD A-shares gained +2.8% in November 2017. The fund underperformed the MSCI Frontier Markets Asia Net Total Return USD Index (+13.9%) but outperformed the MSCI Frontier Markets Net Total Return USD Index (+1.2%), and the MSCI World Net Total Return USD Index, which was up +2.2%. The performance of the AFC Asia Frontier Fund A-shares since inception on 31st March 2012 now stands at +74.6% versus the MSCI Frontier Markets Asia Net Total Return USD Index, which is up +86.6%, and the MSCI Frontier Markets Net Total Return USD Index (+55.8%) during the same time period. The fund’s annualized performance since inception is +10.3% p.a., while its YTD performance stands at +2.5%. The broad diversification of the fund’s portfolio has resulted in lower risk with an annualised volatility of 8.88%, a Sharpe ratio of 1.14 and a correlation of the fund versus the MSCI World Net Total Return USD Index of 0.34, all based on monthly observations since inception. It was a good month for the fund, with most of our major markets doing well, but once again the fund’s closest benchmark, the MSCI Frontier Markets Asia Index, outperformed the fund by a large margin due to the concentration of this index in only a few names. After Pakistan was upgraded to the MSCI Emerging Markets Index, the mix of the benchmark has changed significantly with Vietnam now accounting for 74.3% of the index compared to 15.9% as of 31st May 2017, the last day on which Pakistan was part of the benchmark. Furthermore, Pakistan accounted for 63.0% of the benchmark as of 31st May 2017 but now has a zero weight in it whilst we continue to invest in Pakistan and the country accounts for 20.7% of the fund’s portfolio, since we follow a value and benchmark agnostic approach. This was a peculiar month where most of the Vietnamese stocks in the benchmark did well, particularly Vinamilk and Vingroup, which saw a total return of 23.6% and 27.4% respectively and which account for 27.9% and 11.7% of the benchmark respectively. Therefore, though the MSCI Frontier Markets Asia Index is the fund’s closest benchmark, we continue to follow a benchmark agnostic approach focusing on undervalued stocks which in the short run has resulted in a skewed relative performance, however in the longer run it is this benchmark agnostic approach which has helped us generate returns (especially in sideways and down-trending markets) which are superior to the benchmark. Gains this month were led by Vietnam as the economic momentum continues. November industrial production growth came in at 17.2% YoY with the manufacturing sector leading with growth of 24.3%, while retail sales grew by 9.5%. Given the bullishness across the economy, the fund’s small and mid-cap Vietnamese holdings did well, however the large cap’s in the banking, consumer and real estate sectors have rallied significantly over the past month which led to the VN Index reaching levels previously seen in 2007 with a monthly gain of 13.5%. The rally over the past month in the large caps has primarily been event driven. Vinamilk, the biggest company by weight in the VN Index, gained 23.6% during the month after Hong Kong-based Jardine Matheson’s Singapore subsidiary bought the 3.3% stake sold down by the State on 10th November at a price of VND 186,000, a 24% premium to the starting bid price and at a P/E multiple of 29x trailing 12-month earnings. This led to excitement amongst other investors leading the stock to rally. Sabeco, the largest beer brewery by market share in Vietnam, has also been rallying over the past few months as the State looks to sell down its position in the company. The government hopes to sell its stake at a heady trailing 12 months P/E of around 47x for a company growing earnings at high single digit to low double digits. Though efficiencies and margins can be improved by a foreign acquirer, this may not be easy as the new owner will not have a controlling stake with the government still retaining 36% in the company after the sale. Vietcombank led a rally in the banking stocks as talks surrounding a stake sale to a sovereign wealth fund resurfaced while the newly listed Vincom Retail witnessed strong buying interest which benefitted its parent company Vingroup (trading at a trailing 12 months P/E of 60x) as well. The five companies mentioned above account for around 38% of the VN Index and when these stocks rally in tandem, index returns do get skewed. Strategically we prefer not to chase stocks and would look to enter some of the large cap names at a more opportune time and/or at more attractive valuations given that the fund’s Vietnamese holdings are trading at a trailing 12-month P/E of 12.2x compared to the VN Index trailing 12-month P/E of 18.9x. Mongolia continued to do well for the fund this month with gains largely driven by an integrated cashmere producer. 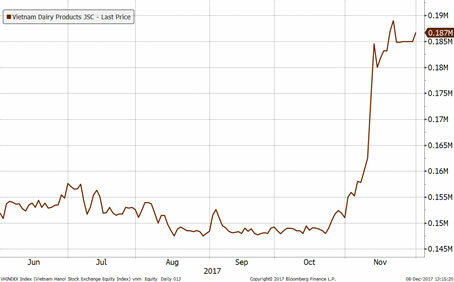 Year to date, the Mongolian Stock Exchange (“MSE”) is up 92% in USD terms making it the second best performing stock exchange in the world (behind Venezuela), bolstered by an improving economic climate rooted in the robust export of coal, copper, and oil. On 17th November 2017, Fitch revised the outlook on Mongolia's Long-Term Foreign-Currency Issuer Default Rating (IDR) to positive from stable based on reduced government debt, decreased refinancing risk and the IMF program moving ahead again. On 27th November 2017 the Financial Regulatory Commission passed legislation enabling dual listing of foreign-listed companies onto the Mongolian Stock Exchange and vice versa. This opens the possibility for a significant increase in liquidity and investor interest in the MSE as currently the majority of investors are local retail, with foreign funds yet to largely participate. Bangladesh did well for the fund this month thanks to positive moves in a food products company which is focusing on building an ice-cream business in a hugely under-penetrated market. This company has already captured a 16% market share and continues to build its distribution network and capture market share from the two existing incumbents. Other positive moves for the fund came from a pharmaceutical company which declared good quarterly results and has the highest market share in the domestic pharmaceutical industry while the fund’s telecom holding in the country continues to do well on the back of growing data penetration. We continue to remain positive on the Bangladesh market, especially the consumer story, but near-term headwinds to profit margins could come in the form of currency depreciation as the Bangladeshi Taka has been slightly weaker this year and depreciated by 4% so far this year on the back of a rising but manageable current account deficit. Pakistan had a good start to the month but the now normal story of political noise continued to impact market sentiment which led to weakness in the latter half of the month. A political protest by a right-wing party in the capital Islamabad led to tensions rising in the end of November, but with elections coming up next year such posturing by various parties does not come as a surprise as we have pointed out since the start of the year. Despite the political uncertainties, economic activity continues to expand with auto sales and domestic cement sales growing by double digits while private sector credit has also grown at high double digits this year which should lead to GDP growth momentum sustaining into 2018. Concerns on the Pakistani Rupee and the current account deficit remain but Pakistan is now the cheapest stock market in our universe, as well as one of the cheapest in the Emerging Asia region with the KSE100 Index trading at a trailing 12-month P/E of only 7.8x. The market correction has opened up valuation across sectors and five companies within our Pakistani holdings have a net cash position which is greater than 25% of their market capitalisation as the fundamentals of most companies in Pakistan remain strong. Sri Lanka remained soft as the floods, drought, and VAT led price increases continue to impact consumer spending while the latest budget was also tabled during the month. The major change was the reduction of excise duties for beer while they were revised upwards for the hard alcohol industry which may negatively impact Arrack players since lower beer prices could eat into the market share of Arrack. A Nation Building Tax will also be imposed on the entire alcohol industry which may lead to price increases. Other possibly negative decisions were the debt repayment levy and cellular tower levy imposed on banks and telecom companies respectively which may be passed onto the consumer leading to higher prices. Further, duties will be levied on sweetened beverages and VAT will be imposed on condominium units which could also lead to higher prices for the consumer. On the positive side, the government continues to promote domestic manufacturing and plans to introduce tax concessions for domestic pharmaceutical manufacturing given that Sri Lanka imports a majority of their pharmaceuticals. The budget appears to be tough on the consumer but fiscal consolidation was expected given the fiscal deficit and government debt levels and although the consumer may face some headwinds due to the recent impact on disposable incomes, on a bottom up basis there continue to be opportunities in Sri Lanka with the Colombo All Share Index trading at a trailing 12 months P/E of 11.2x, lower than its five year average of 14.3x. The best performing indexes in the AAFF universe in November were Mongolia (+15.7%), Vietnam (+13.5%), and Bangladesh (+4.8%). The poorest performing markets were Cambodia (−4.5%) and Sri Lanka (−3.1%). The top-performing portfolio stocks this month were: a cashmere producer (+42.0%), an agricultural company (+37.5%), and a ceramic producer (+32.1%) (all from Mongolia) and a Vietnamese cement producer (+26.9%). In November, we added to existing positions in Bangladesh, Laos, Mongolia, Pakistan, Papua New Guinea, Sri Lanka and Vietnam. We newly invested in a Pakistani conglomerate and exited a Vietnamese consumer goods conglomerate, a Sri Lankan alcoholic beverage company and a Burmese holding company. Additionally we partially sold two companies in Mongolia and one in Vietnam. As of 30th November 2017, the portfolio was invested in 115 companies, 1 fund and held 4.2% in cash. The two biggest stock positions were a pharmaceutical company in Bangladesh (7.8%) and a Mongolian cashmere apparel producer (3.2%). The countries with the largest asset allocation include Vietnam (26.5%), Pakistan (20.7%), and Bangladesh (17.4%). The sectors with the largest allocations of assets are consumer goods (29.9%) and industrials (14.9%). The estimated weighted average trailing portfolio P/E ratio (only companies with profit) was 15.99x, the estimated weighted average P/B ratio was 2.69x, and the estimated portfolio dividend yield was 4.18%. AFC Iraq Fund (Non-US) Class D shares returned +5.2% in November with a NAV of USD 557.64 which is an outperformance versus its benchmark, the RSISUSD index, which gained +4.2%. 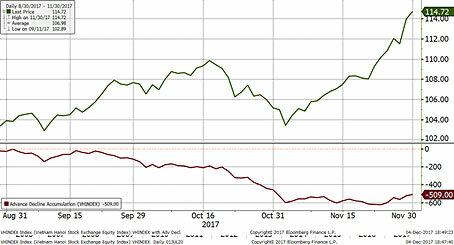 The fund is now down −9.1% year-to-date, outperforming the RSISUSD index which lost −14.4% in the same time period. The “dog days” of the summer extended from October into the first 10 days of November, as the 40-day Arba’een pilgrimage came to an end, with continued declines in turnover and prices. Later on in the month, this pattern was sharply reversed as buying interest drove prices and turnover significantly higher. 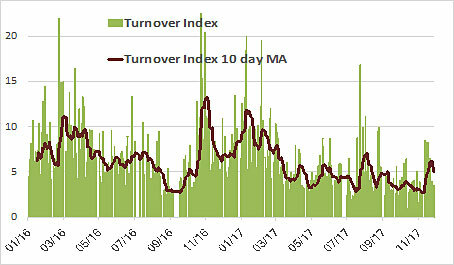 The market, as measured by the RSISUSD Index, was up almost +10% by mid-month, with daily turnover almost doubling on the up days as the chart below shows, before settling in at +4.2% as the buying activity subsided. The driver of the turnaround was a modest recovery in liquidity as the dividends that banks announced earlier in the summer were reinvested. 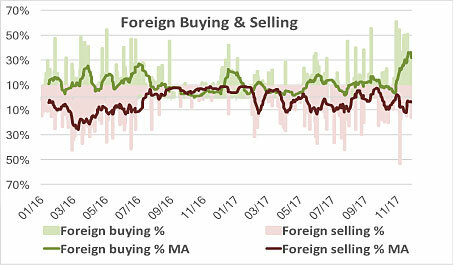 Importantly, a revival in foreign buying, partly a re-investment of dividends and partly fresh inflows, accounted for most of the buying and the subsequent market recovery (see chart below). In addition to the high-quality banks that announced dividends of up to 11% (at time of announcement), mobile operator Asiacell (TASC) declared a 14% dividend. Its valuations are equally attractive, as those of the high-quality banks in that it is trading at under 2x trailing 12 months EV/EBITDA. Much like the banks, these attractive valuations come with improving fundamentals as the company begins its recovery from the triple whammy that the ISIS conflict brought: A loss of the third of the country accompanied by subscriber losses and higher operating costs, decreasing ARPU’s (average revenue per user) that accompanied the roll out of 3G in 2015, and finally weakened consumer spending made worse by the introduction of VAT on SIM cards in 2016. 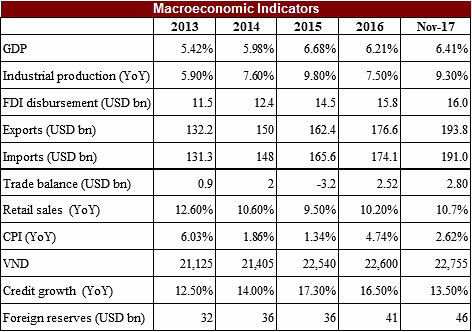 The first visible beneficiary of the recovery in oil prices has been the country’s foreign reserves, which increased to USD 49 billion by end of November versus USD 45.2 billion at end of 2016, and IMF’s estimates of USD 41.5 billion by end of 2017. 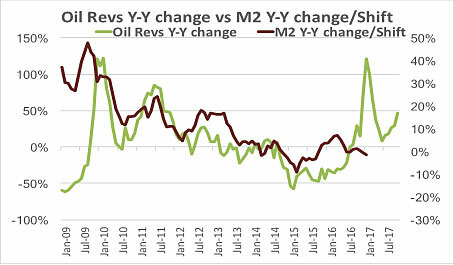 However, money supply is yet to follow given the observed time lag of about 7-9 months as the chart below shows: it shifts the Y-Y percentage change in M2 back by 9 months versus the Y-Y percentage change in oil revenues. Arguably, the changed dynamics of the oil market, with a likely medium-term range of USD 55-60/bbl for Brent, should result in a sustainable positive effect on the economy, as the recovery in foreign reserves would be followed by a recovery in money supply and eventually the broader economy. As of 30th November 2017, the AFC Iraq Fund was invested in 14 names and held 3.7% in cash. The fund invests in both local and foreign listed companies that have the majority of their business activities in Iraq. The countries with the largest asset allocation were Iraq (97.2%), Norway (2.3%), and the UK (0.4%). The sectors with the largest allocation of assets were financials (53.5%) and consumer staples (22.3%). The estimated trailing median portfolio P/E ratio was 11.56x, the estimated trailing weighted average P/B ratio was 0.88x, and the estimated portfolio dividend yield was 5.60%. 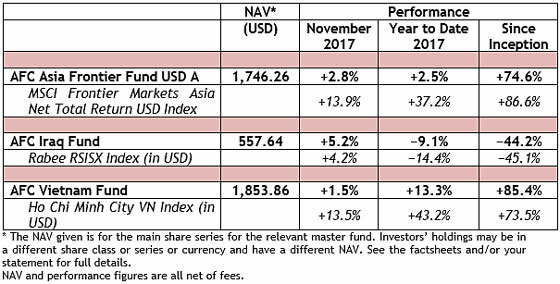 The AFC Vietnam Fund gained +1.5% in November with a NAV of USD 1,853.86, bringing the net return since inception to +85.4%. This represents an annualised return of +17.0% p.a. The November performance of the Ho Chi Minh City VN Index in USD was +13.5% while the Hanoi VH Index gained +9.1% (in USD terms). 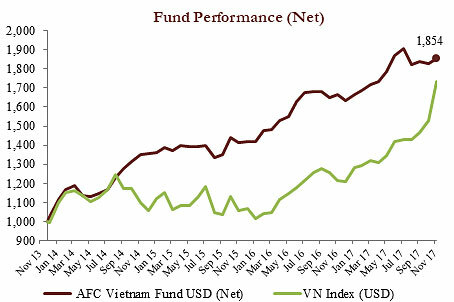 Since inception, the AFC Vietnam Fund has outperformed the VN and VH Indices by +11.9% and +29.3% respectively (in USD terms). The broad diversification of the fund’s portfolio resulted in a low annualized volatility of 8.96%, a high Sharpe ratio of 1.86, and a low correlation of the fund versus the MSCI World Index USD of 0.28, all based on monthly observations since inception. November 2017 will be probably remembered as the “craziest” month in Vietnam’s relatively young stock market history. Government auctions for leading companies, such as Vinamilk (a rather small placement of 3.33%) and Sabeco among others, got attention from financial and strategic investors which led to extreme gains in those stocks, which are index heavyweights. While the government was not able to place all of their offered Vinamilk shares last year, they were able to sell them last month at a 30% higher price. Vinamilk is the stock with the highest weighting in the HCMC Index being 10.8%. The VN Index therefore rallied +13.5% last month. The Hanoi index was also able to gain substantially with +9.1%, while the market breadth only improved in the last few days of the month. The highest weighted stock in the Ho Chi Minh City Index, as well as in many other Vietnamese and frontier market indices, Vinamilk (VNM) had an amazing run in November which helped push up the benchmark Index by +2.5%. The stock soared +23.6% in November from VND 151,000 per share to VND 186,700 per share. The market capitalization of Vinamilk therefore reached USD 11.9 billion. The reason for that unusual jump was the USD 1 billion investment of Singapore based Jardine Cycle & Carriage (JCC) – a subsidiary of Jardine Matheson. Not the investment itself, but the aggressive way the buying took place surprised the market participants and resulted in a short-term rerating of the stock. The story actually started back in December 2016, when the Vietnamese government announced their intention to divest a 9% holding of Vinamilk, equivalent to 130.63 million shares. 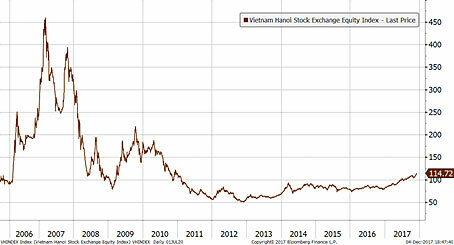 At the time, the initial offering price was VND 144,000 per share compared to a market price of VND 135,000 per share. The interest at that price was very modest with only 60% of the total shares offered sold. Fast forward to early November 2017, or just 11 months later, and the government announced their intention to divest another 48.33 million shares, equivalent to a 3.33% stake in Vinamilk. This time the market price was VND 151,000 per share, while the minimum bid price for the 3.33% stake was set at VND 151,200. 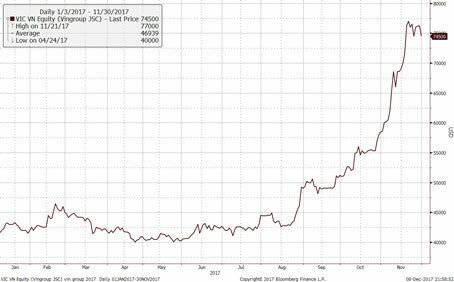 JCC ended up taking all 48.33 million shares offered at VND 186,000 per share; equivalent to a hefty 23% premium to the offering price (other offers were around VND 155,000!). In other words, JCC paid USD 73 million more than the minimum buying price – a pleasant gift for the government of Vietnam. Furthermore, JCC continued to increase its stake to more than 10% by buying more shares on the open market. After that news was disclosed the market price closed the gap, but one has to ask himself why did JCC show no interest last year at a price which was 23% lower? Other important investments where JCC holds 20-25% include Siam City Cement of Thailand and REE of Vietnam, a company we also hold in our fund and where JCC just announced their intention to raise their stake to 24.99%. The successful divestment of the government in Vinamilk already affected other upcoming divestments such as Sabeco (SAB) and Habeco (BHN). Both stocks also jumped strongly in November by 15.4% and 40%, respectively without any fundamental news, driven only by the announcement of the sale of a government stake. Vingroup (VIC), another index heavyweight with a market capitalization of USD 8.8 billion, had already been more expensive than the market for a long time and was moving sideways for most of this year until they announced the listing of their retail subsidiary, Vincom Retail (VRE), which is now trading at a lofty valuation of around 38x earnings. While this valuation is unattractive for value investors, momentum players on the other hand have pushed the stock price of the parent company up 75% over the past three months. At least the current valuation is a round number – with a P/E of around 60x! All of this speculation affected the market massively and with this record monthly surge in the index the RSI is standing at an amazing high value of around 98, for about a week now, which means it is in extreme overbought territory. Of course, it hurts to see that type of market action during a time when the majority of stocks are heading sideways. On the other hand, we do not see any reason to take the risk and chase already expensive stocks in the short term while we still see so many bargains in the overall market. Moreover, the Index is distorted by many big cap stocks such as ROS, VIC, SAB, VRE whose P/E’s are currently 212x, 60x, 49x and 38x respectively! Because of those stocks, the Vietnam stock market looks relatively expensive at a P/E ratio of 18x. According to our calculation, without the effect of these stocks, the index valuation would still be attractive with a P/E of 14.7x, while the P/E of our portfolio is more than 30% below that at around 10x. In contrast, ETF’s will consequently now have to overweight the most expensive stocks in the market - we can have much calmer nights of sleep with the valuation and diversification of our portfolio. In a long-term bull market, as we see in Vietnam, stock market leaders are changing in cycles and for the last 2-3 years big caps were favoured over value stocks. Given the strong moves and high valuation of some of the bigger companies, the search for more attractive valuations by just a few investors would be sufficient for small caps to catch up with the market. Such a rotation always leads to very strong moves in smaller companies as history shows, with retail investors jumping onto the bandwagon. This is certainly a scenario we are hoping for! Vietnam’s trade surplus in the first 11 months of 2017 reached USD 2.8 billion. Export turnover growth accelerated month over month from 7.6% in January to 21.1% in November to reach USD 193.8 billion. The trade balance jumped from USD -3.0 billion to USD +2.8 billion. The momentum of this recovery and growth comes mainly from exports in mobile phones (+30.6%), electronics and computers (+38.1%), textiles and garments (+9.5%), and machineries and equipment (+27.0%). The Vietnamese stock market has three stock exchanges, Ho Chi Minh City (VN Index), Hanoi (HNX Index), and UpCOM (UpCOM Index). Most investors are familiar with HSX and HNX but haven’t heard about the UpCOM stock market. UpCOM is considered to be a sub-market of HSX and HNX where most OTC stocks are listed. However, the State Securities Commission (SSC) has raised the profile of UpCOM significantly. Quite a few of the state-owned companies will be listed on UpCOM after privatization. Therefore, the total market capitalization of UpCOM has risen sharply over the past 3-4 years and has surpassed the Hanoi Stock Exchange. At the end of November 2017, the market cap of UpCOM reached USD 25.1 billion, compared to USD 9.1 billion for the Hanoi Stock Exchange and USD 109 billion for the Ho Chi Minh City Stock Exchange. 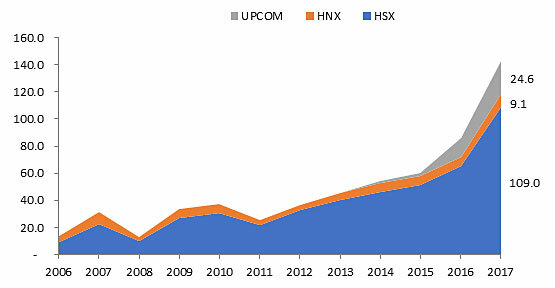 At the moment there are 667 listed stocks on the UpCOM market, compared to 346 stocks on HSX and 381 stocks on HNX. There are 3 stocks whose market cap has surpassed USD 1 billion, ACV (Aviation Corporation of Vietnam), HVN (Vietnam Airlines), and MCH (Masan Consumer Corporation). Industrial production growth accelerated to 9.3% in November, much higher than 7.4% in the same period last year. Exports showed impressive growth of 21.1% in November, reaching USD 193.8 billion. Imports also increased 21% to USD 191 billion. FDI (Foreign Direct Investments) registrations reaching a record high of USD 33.1 billion, jumping 53.4% compared to same period last year, while FDI disbursement increased to USD 16 billion, +11.9%. Credit growth hiked to 13.5% and foreign reserves continue to rise to a new record high of USD 46 billion in November 2017. At the end of November 2017, the fund’s largest positions were: Agriculture Bank Insurance JSC (3.6%) – an insurance company, Sam Cuong Material Electrical and Telecom Corp (2.7%) – a manufacturer of electrical and telecom equipment, Global Electrical Technology Corporation (2.3%) – an electrical equipment company, Dong Nai Port JSC (2.0%) – a port operator, and Cantho Pesticides JSC (2.0%) – a manufacturer of agricultural chemicals. The portfolio was invested in 77 names and held 2.5% in cash. The sectors with the largest allocation of assets were consumer goods (34.3%) and industrials (28.6%). The fund’s estimated weighted average trailing P/E ratio was 10.03x, the estimated weighted average P/B ratio was 1.72x and the estimated portfolio dividend yield was 6.34%. Cambodia—the Golden Period: lost…but maybe found again? Late afternoon in Phnom Penh and after the intense heat of the day, a cooling beer at the Foreign Correspondents Club increasingly appeals. We go to the bar on the first floor and gaze out over the Mekong river, luxuriating in both the atmosphere and the view. As the first Beerlao is sipped I hear the strains of a female singer coming from the loudspeakers behind the bar. She has a soft voice, high pitched and mournful. A pretty voice. When I order the next beer I ask the barman, a man of a certain age, who the singer is and he looks wistful. He shows me the CD cover and I see the face of a beautiful woman, late 20s, early 30s perhaps, dressed chicly in what I shall call, but for which sin I shall most probably be excommunicated, CamboDior. I ask if she still sings in the clubs here in modern Phnom Penh. No, he tells me; she was killed by the Khmer Rouge during the terror in the 1970s. He was not sure quite when they murdered her but he thinks it was soon after the fall of the city in 1975. Her name was Ros Sereysothea. He, a survivor of the terror, remembered her songs from his youth. A few more conversations and a little research and I begin to discover that Ros Sereysothea was one of several then well-renowned singers from the pre-Khmer Rouge period: Mao Sareth, Pen Ran and Houy Meas also played the clubs, sang on national radio, recorded on Wat Phnom Disques and sang duets with Sinn Sisamouth, the smooth, dinner-jacketed Cambodian crooner, a favourite of Prince Norodom Sihanouk. A stroll through the web and I find many black and white photographs of beautiful women with trim waistlines and beehive hairstyles and handsome men, fitting their 'tuxedos' well and often, in the background, fantastically modern, Courbusier style houses with their round corners, sharp corners, porthole windows and long, curved terraces. Digging a little deeper unearthed references to 'the Golden Period' which began, on or about 1955 and lasted until 1970. We read little, if anything of this period now, it has been almost forgotten. For obvious reasons we read largely of the terror, of the Khmer Rouge years when perhaps a third of the country was murdered and when the gene pool was deliberately and successfully targeted by Angkar: the 'brain' of Pol Pot's murderous regime. What was it about this preceding period I wondered which allowed for such an explosion of talent in the arts, in music, in film and in architecture throughout the 1960s? Why was Cambodia looked at by other Southeast Asian countries as an example, even an inspiration, a model of what they themselves wanted to be? The simple (but not sole) answer is Prince Norodom Sihanouk. Educated, cultured, modern, an arch Francophile and yet at the same time entirely at one with his own Khmer cultural roots. The Sangkum Neastr Niyum, variously translated as a 'community of common people' or 'a socialist movement' was the political party set up by Norodom when he abdicated in 1955 in favour of his father so as he, Norodom, could go into politics. More of a movement than a straightforward political party the Sangkum ran the country on vaguely left of centre principles and policies throughout the 1960s with Prince Norodom Sihanouk as its head. Norodom believed in a sort of Buddhist socialism which sought not to confiscate but to encourage charity and the consequent making of merit derived thereby. Sihanouk's aim, throughout the 15 year Sangkum period was to portray to the outside world a modern, artistic and cultured country. He produced several films (usually of debatable quality) and wrote dozens of songs himself. He encouraged young students to go to Paris to learn the art of film-making and, perhaps most importantly for the cultural legacy, he appointed the Courbusier-trained Vann Molyvann as the state's principle architect. There were certainly political excesses and errors throughout this 15 year period (not the least of which was the sacking of the British and American embassies in March 1964, a manifestation of Norodom Sihanouk's frustration at the perceived failure of the 'Anglo Saxons' to reconvene the 1954 Geneva Peace talks which had guaranteed Cambodia's independence). And Sihanouk brooked little, if any political opposition but still the period is remembered as ‘The Golden Period’. The Prince sought to keep Cambodia out of the wars going on around him in Vietnam and in Laos but the US bombing of the Ho Chi Minh trail which stretched into the east of Cambodia and the consequent huge civilian casualties was one (but not the only) factor which put paid to his efforts. By 1970 the right wing in Phnom Penh was tired of Norodom’s anti US speeches and they worried they would be left to the ‘reds’. Lon Nol, the police chief in Phnom Penh lead a coup which overthrew Sihanouk and for the next five years the country suffered a brutal civil war. Worse was to follow in 1975 when the Khmer Rouge took power and spent the next four years taking the country back to the Stone Age and mass-murdering over 1/3rd of the population. So what is left of this once cultured, Francophile and elegant country? Why visit and, for readers of this newsletter, why invest? Go to Kep to find out, Kep sur Mer on the south coast of the country about 145 kilometres from Phnom Penh. Kep began life around 1904/1905 when the French stumbled upon the place as they looked for a beach ‘resort’ to where they could escape from the heat of the capital. Kep grew over the decades and became a kind of Indochine Deauville or Trouville. 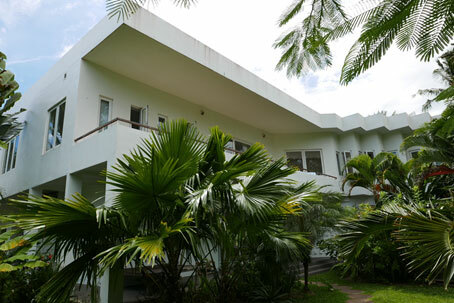 Elegant villas were built overlooking the sea and restaurants opened up behind the casuarina trees on the gently curving coast. The monied travelled from Phnom Penh every weekend and Europe’s beautiful people visited with, in the 1960s, Catherine Deneuve at the fore. Kep fell to the Khmer Rouge early in 1971 and they began systematically to blow up the evidence of the decadence, ie, the villas. 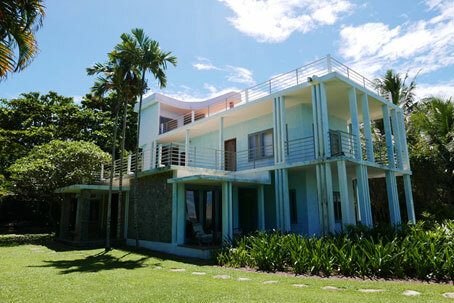 Many were destroyed but some remain and several of these have been renovated quite superbly, two of the best examples being the Villa Romonea on the western side of the promontory and also The Blue House at the resort hotel Knai Bang Chatt, both shown below. multi award winning eco-boutique hotel. The growth in boutique tourism in Kep illustrates well what is going on in Cambodia generally with mile after mile of lovely beach, an exciting, Indochine capital in Phnom Penh and, of course, the extraordinary Angkor Wat. Visitors need to be fed and watered but, more importantly, so does the local population and that has now grown back to over 17 million people of whom 25% are under 21. People want mobile phones, they want trendy jeans, they want a decent beer and more than a mere bowl of noodles at the end of a working day: increasing domestic consumption, one of the great growth stories in Southeast Asia is perhaps best demonstrated in Cambodia, with its young and growing population and its very low economic base which of course is why the AFC Asia Frontier Fund invests in the country. So: beautiful, exotic and well on its way back from the years of the terror, there’s little to dislike about Cambodia. Visit it, invest in it or both but don’t for goodness sake ignore it—life’s too short to miss places like this. From all of us at Asia Frontier Capital, we hope that you have enjoyed reading this newsletter and we would like to wish you and your family a Merry Christmas and all the best for a successful and profitable 2018! AFC Asia Frontier Fund is registered for sale to qualified /professional investors in Japan, Singapore, Switzerland, the United Kingdom and the United States. AFC Asia Frontier Fund (LUX) is registered for sale in Luxembourg to professional investors and well informed investors. 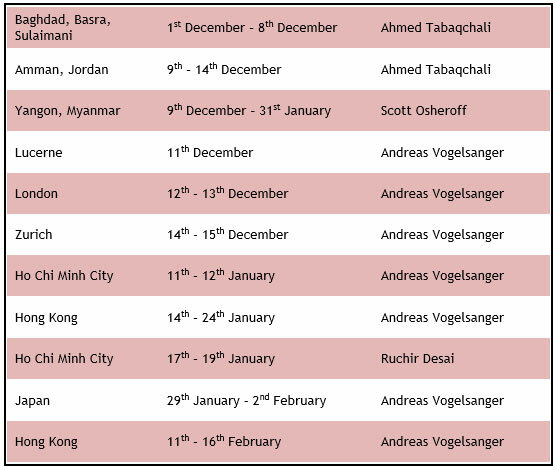 AFC Iraq Fund in Singapore, Switzerland, the United Kingdom and the United States. AFC Vietnam Fund in Japan, Singapore, Switzerland and the United Kingdom.